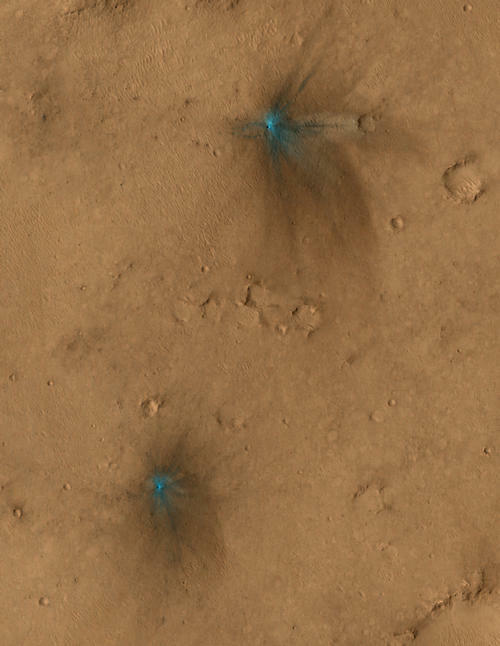 These images from the NASA Mars Reconnaissance Orbiter show several impact scars on Mars made by pieces of the NASA Mars Science Laboratory spacecraft that the spacecraft shed just before entering the Martian atmosphere. Examining these features with knowledge of what made them could aid researchers in interpreting hundreds of scars on Mars made by unknown impactors. The entry vehicle portion of the Mars Science Laboratory spacecraft, containing the Curiosity rover for delivery to the surface, separated from the mission's cruise stage 10 minutes before reaching the top of the atmosphere on Aug. 5, 2012, PDT (Aug. 6, UTC). The cruise stage had performed vital functions during the flight from Earth to Mars. Two minutes after letting go of the cruise stage, the entry vehicle jettisoned two 165-pound (75-kilogram) blocks of tungsten called "cruise balance mass devices." The Context Camera on the Mars Reconnaissance Orbiter acquired an image of the predicted impact site for the tungsten blocks, revealing four large impact markings that appear very recent. The site is about 50 miles (about 80 kilometers) west Curiosity's landing site. The orbiter's High Resolution Imaging Science Experiment (HiRISE) camera subsequently covered these impact sites in the two images combined here, showing the impacts in greater detail, and also revealing a large number of new small impact sites. This mosaic combines portions of two HiRISE images (catalogued as ESP_029245_1755 and ESP_029601_1755), presented at 20 inches (0.5 meter) per pixel. White boxes indicate locations of the four large impacts and some smaller impacts. Three other images, figures 1, 2 and 3, provide full-resolution (10 inches or 0.25 meters per pixel) views of the four large impacts, two of which are close together. The strewn field of impacts is at least 5 miles (8 kilometers) long. A third HiRISE image, at http://www.uahirise.org/ESP_028889_1755, also shows many small fresh-looking impacts, and if it is part of the same strewn-debris field then the field is about 7.5 miles (12 kilometers) long. Researchers were expecting to see just two impact sites from the tungsten blocks, and it is highly unlikely that these dense blocks broke apart in the atmosphere. The only other source of impacts at nearly the same time and place is the cruise stage itself, which was more likely to break apart in the atmosphere. The impacts were highly oblique, as shown by the asymmetric shapes of the individual impacts and the elongation of the strewn-debris field. 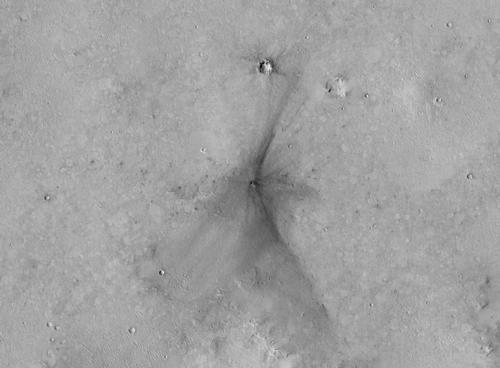 The large impacts created craters with diameters ranging from 10 to 16 feet (3 to 5 meters) diameter, about what was expected from the tungsten blocks. The large impacts that are close to each other and of similar size probably originated from the tungsten blocks. The other two impacts, which have more asymmetric ejecta, may be from the cruise stage breaking apart into two main pieces while in the atmosphere. The many smaller impacts may have been formed by secondary impacts of material thrown from the large impacts, or by additional pieces of the cruise stage, or both. 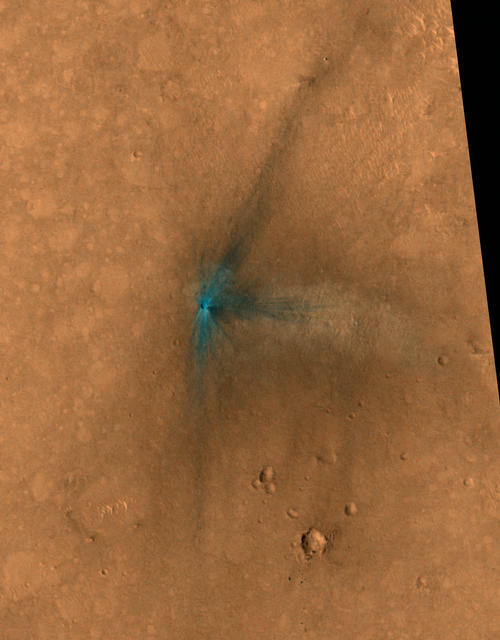 Although hundreds of new impact sites have been imaged on Mars, researchers do not know the initial size, velocity, density, strength, or impact angle of the objects. For the Mars Science Laboratory hardware, such information is known, so study of this impact field will provide information on impact processes and Mars surface and atmospheric properties. The MSL descent stage later released six smaller, 55-pound (25-kilogram) tungsten blocks from a much lower altitude, whose impact markings have been imaged by the Context Camera; see http://photojournal.jpl.nasa.gov/catalog/PIA16016 and http://photojournal.jpl.nasa.gov/catalog/PIA16015 . This April 10, 2015, view from the Navigation Camera on NASA's Curiosity Mars rover shows the terrain ahead of the rover as it makes its way westward through a valley called "Artist's Drive." The Curiosity Cam live video feed allows the public to watch technicians assemble and test NASA's next Mars rover in a clean room at the Jet Propulsion Laboratory, Pasadena, Calif. This view from the Mast Camera (Mastcam) on NASA's Curiosity Mars rover shows a site with a network of prominent mineral veins below a cap rock ridge on lower Mount Sharp. ​NASA's Curiosity rover has discovered ancient organic molecules on Mars, embedded within sedimentary rocks that are billions of years old.